Jeg har jo måtte kjøre utenbys for å se Costas største, og C' Pacifica har jeg stiftet bekjentskap med i Ålesund og på Åndalsnes. Ja, de vet vel at de kan ta inn store skip her også nå da, når det gikk så greit med Queen Victoria i mai. 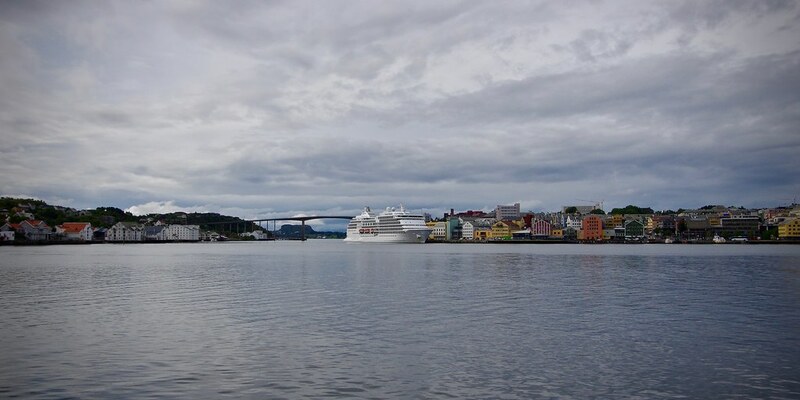 Snakket med en los og han sa at de hadde kjørt ganske heftige simulatorforsøk på å ta inn Queen Mary 2 til Kristiansund, og det gikk jo veldig greit det. Det var meningen at Cunard skulle stille med QM2, men så fikk vi QV i stedet, uten at det hadde noe å si for meg. Hyggelig at Cunard finner Kristiansund interessant. 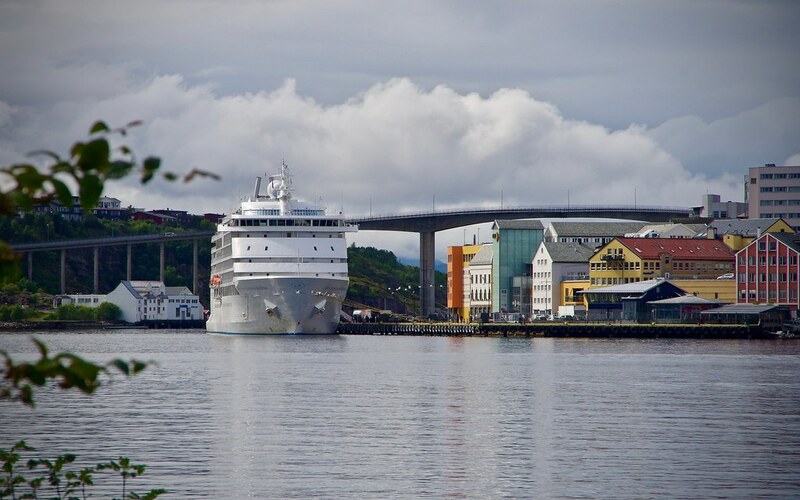 Så hadde vi jo det tiltenkte Cunard-skipet Arcadia inne nå i sommer, så joda, Kristiansund har tatt steget opp fra å være en havn for cruiseskip av middels størrelse til også å kunne ta de store. I agree strongly on what you say about the exterior look of the ship. 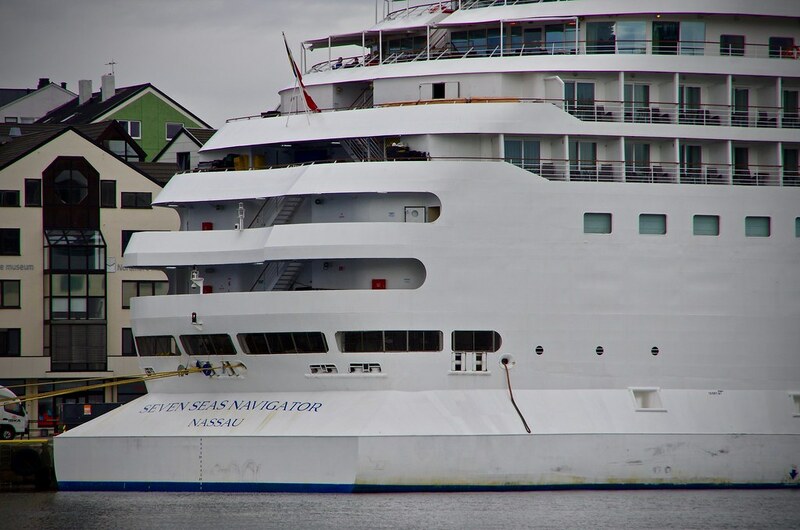 We often see crew with both hoses, brushes and white paint here in Kristiansund, but not today. 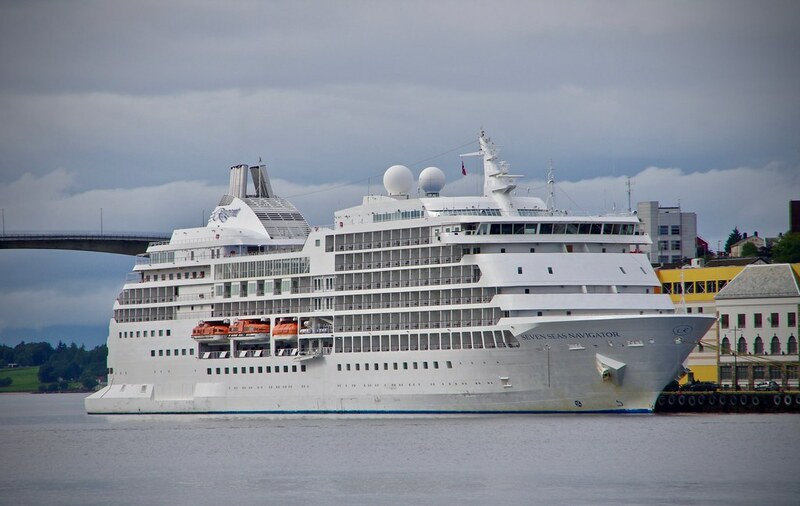 Yeah... the great thing with Crystal Cruises was that they didn't only WANT to be the best in the world, they really WORKED hard on making sure that happened. The crew of Crystal was so dedicated, so professional and so wonderful... Needless to say, I've never worked with this particular line, but it does surprise me that they doesn't even have a paint raft on the water to do something with the rust marks. Naturally, there could be a simple reason to this as well: the port authority not allowing such work to be performed. First of all, thank you for taking time to share those images. It's a great looking ship, BUT, I have to say that I'm slightly disappointed at the lack of attention to detail on her ship side. One of the most important things we did in Crystal Cruises, whether on world cruise or not, was to make sure our ship side was sparkling white ALWAYS, with no exception. I remember we were even teasing each other (the Chief Officer on vacation and on duty), if there was an image of the ship with rust on the ship side. It was all about attention to detail and wanting to make our ship shine. 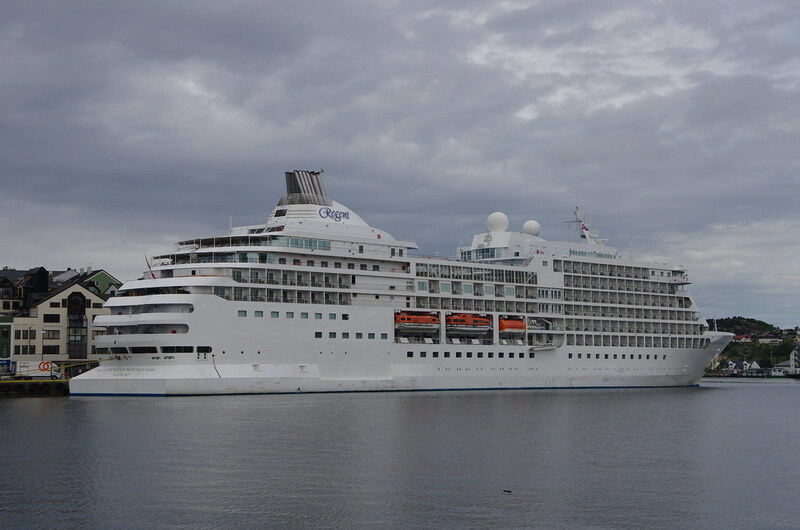 We were so proud of the Crystal Symphony, and her ship-side always reflected the Chief Officer on duty. The worst times was after several sea-days.... but then, we asked the agent for early clearance for a couple of deck hands to clean the ship side prior to guest clearance and debarkation. 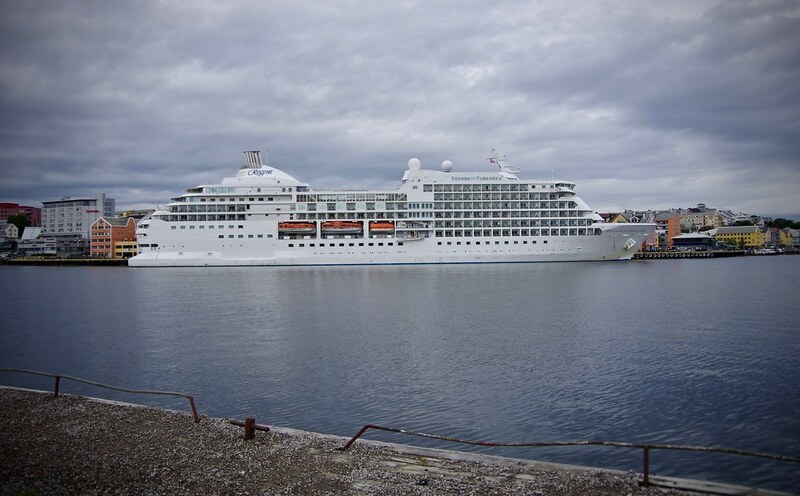 On a cruise when guests pay that much, there should always be paid extra attention to the ships look and profile - knowing that we would be photographed on arrival, in port and on departure. That attention to detail for example also stretched to the decoration lights at night: one broke bulb meant the deck guys would have to take down the entire length of lights to replace the bulb. No broken bulbs in our light strings should ever be seen. Oh yes, I remember the old beauties. In the late 1970s we had play cards with aircraft and cruise ships. Don't remember how we played, but the cards had a picture on one side with vital info about the ship on the back side. They were all there, the old ships. Holland America Line ordered the ship from the start. When the keel was stretched, and some more, Cunard took over the ship as they planned that this would be their Queen Victoria. 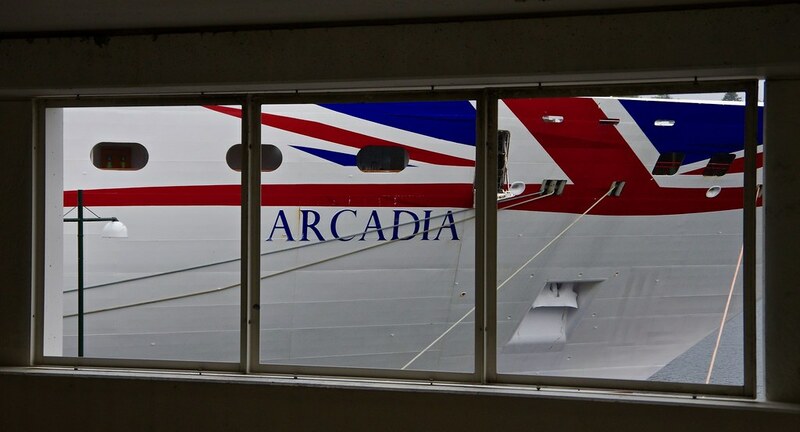 When the typical signature of Cunard was in place (the special cowling around the funnel basement and the main mast), the ship was taken over by P&O Cruises. 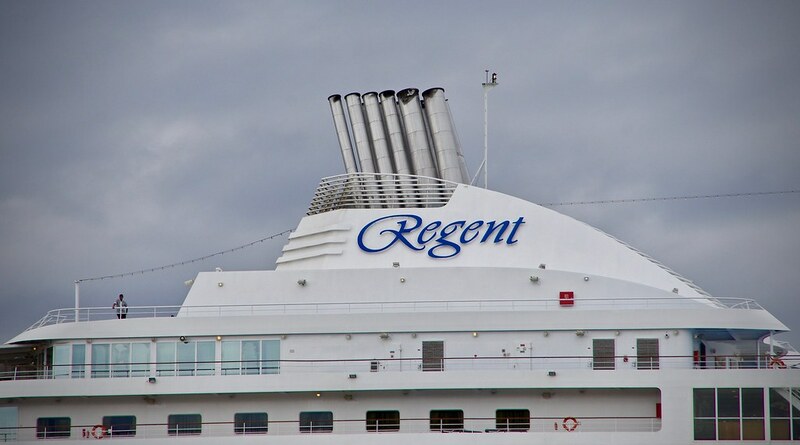 P&O removed the "Cunard cowling" around the funnel, but kept the mast design. Excellent - I knew there was a connection, an interesting background. My thoughts goes back to the years when every ship was a one-off and special, not these pre-fabricated and twin-like ships we have today. Do you remember the Winston Churchill, the Mermoz, Canberra, the exotic Greek ships as well as several more - those were the days. Really nice collection of images of a beautiful ship that has many "traits" from former ship - though she is clearly Cunard-copy. If memory serves me right, wasn't she actually INTENDED to be a Cunard-ship at time of ordering? Love the "did you see that girl" image - cleverly noticed!